Now, this was a film I was really looking forward to. Having garnered a bit of a cult following it not only appears regularly on top zombie movie lists but has also received widespread recognition as an important title, influencing the look, feel and behaviour of the modern zombie. 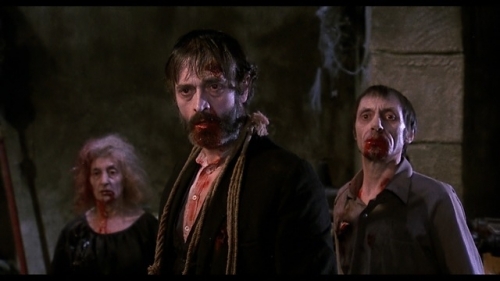 Released in 1974 sandwiched between seminal Night of the Living Dead and the game changer Dawn of the Dead Spanish director Jorge Grau took the suspense and atmosphere of Romero's work and added a bit of European scepticism and surrealism. The premise is relatively simple. 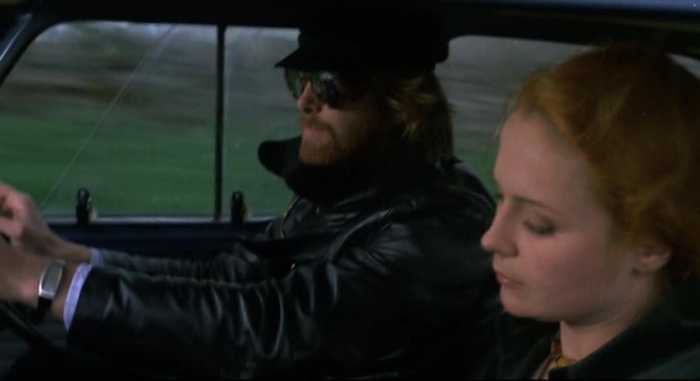 George (Ray Lovelock) is escaping the city for the weekend and stops at a garage for some petrol. At the pump his motorbike is reversed into by Edna (the alluring Cristina Galbó) and having to leave his bike there for repairs the duo reluctantly team up to first drop George off. On the way to Windermere Edna persuades George to first drop her off at her troubled rehabilitating sister in South Gate, happy for him to pick the car up later, but the two become lost and stop to ask for directions at a farm which is assisting the Department of Agriculture run a field test on a prototype alternative to the use of insecticide. Emitting ultra-sonic radiation over a square mile, the boffins at the DOA have worked out a way to stimulate primitive life forms such as insects into a frenzy leading them to kill each other off. Of course there's a catch and unbeknown to the officials the radiation is also having an effect on young babies and the recently deceased. With George receiving directions we're introduced to the our first zombie of the day and it's here we start to see the heavy influence of Romero. The way in which local nuisance and homeless guy Guthrie (Fernando Hilbeck) stumbles after Edna is reminiscent of Bill Hinzman stumbling after Barbra in the iconic scene in Night of the Living Dead. With Guthrie disappearing before George can corroborate Edna's story the two continue their journey to her sister Katie (Jeannine Mestre) only to find Gutherie has beat them there. Here we have our first zombie killing of the story and the first sign that there may be a few inconsistencies with the narrative. If the premise is that the recently deceased still retain some very basic brain function and that is stimulated by the ultra-sonic radiation causing them to reanimate with only basic motor functions and a hunger for sustenance (i.e. human flesh) how is it Gutherie seems not only to know precisely and conveniently where to be to drive the narrative and tension, but can seemingly magic himself around at will. One scene he's chasing Edna near the river where it's reported he drowned, and the next after they've driven at quite the pace to her sisters farm, he's not only managed to beat them there but he's had time for a bit of a chase and a murder. It's all a bit City of the Living Dead, and ambiguous and European, and on it's own I could just about go with it; but I struggled to find room for both this and the rational narrative in my ability to weave it all together as a coherent whole. With George, Edna and Katie all implicated in the murder by the old school small minded chief inspector played brilliantly by Arthur Kennedy, Katie now totally gaga and sectioned and George and Edna falling deeper down the rabbit hole trying to get to the bottom of things themselves, The Living Dead at Manchester Morgue has a change of pace and the problem I talk about above become all the more apparent. Take the two big zombie scenes. The first, an uprising caused from the Department of Agriculture's expansion of the range of the radiation to the nearby morgue; Ok. The second, on checking the crypt to once and for all prove or disprove Gutherie being up and about they get locked in, where Gutherie now adopting a pseudo leadership role is able to resurrect dead comrades by smearing blood on their eye lids; it just doesn't all quite fit together and it's like there are two separate narratives running in parallel. 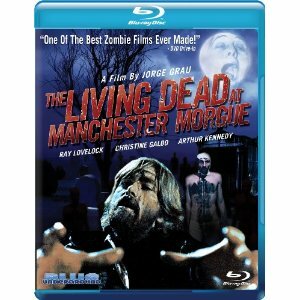 There's a lot to recommend in The Living Dead at Manchester Morgue. The acting is first class and I personally loved the very 70s English interchanges between Edna and George which was full of complexity and subtlety. The style and direction is full of atmosphere and the beautiful and authentic portrayal of mayhem in the English countryside is a delight. The zombies make up and effects expand on what Romero had started and finally delivers the blood and gore Night of the Living Dead lacked. It's not up there with Fulci's gruesome macabre death scenes but you can see its influence. It's all not enough to save the film though and for all the positives I've spoken about, as a whole I found it hard to get that excited and found its faults far outweighed its positives. Also on the one hand while I'd like to argue it's cult status as an influence on both Romero zombie film tradition and more-so also the more surrealist European Fulci film style, in truth I kind of feel it would have all probably happened regardless. It definitely helped cement zombie lore at an important time but I'd argue that it probably actually borrowed more, especially from Night of the Living Dead than it actually contributed. 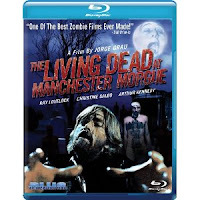 I'd really love to be more passionate about The Living Dead at Manchester Morgue but as it is, the incoherent narrative and mishmash of ideas is too distracting. It's an important part of the zombie film story, I'll go with that, but I'm finding it hard to end the review with anything more than, it's merely ok, 6/10.